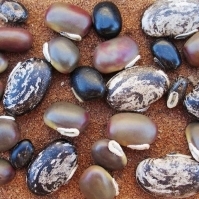 Cover beans with water and soak overnight. Drain the water, rinse the beans and add all remaining ingredients. Cover all with water. Bake in 250 oven for approximately 2 ½ hours, adding more water if necessary.